A powerful fixed spotlight fitted with focusable, highly efficient HMI (hydrargyrum medium-arc iodide) light technology of 400W providing lux illumination at 2000 meters (1.25 miles). Colorlight focuses on reducing lifetime operational and maintenance costs while improving visibility and functionality for the customer. 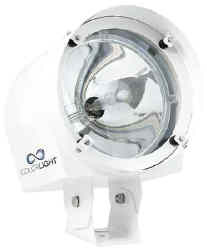 The CL10-01 uses HMI lamp technology to provide high CRI, high CCT (6000K) "daylight" illumination; highly appreciated for navigation and regarded as having the best "ice light spectra" on the market. Use it as fixed headlight, or aft light (for fishing gear). The CL10-01 is constructed of robust acid-proof stainless steel. It is simple to install and comes complete with a compact 100-240V electronic box, bridge panel remote control, 3m (10') power cable, and 5m (16.5') control cable. A powerful fixed spotlight fitted with focusable, highly penetrating (and target reflective) UV (ultraviolet) light technology. It is especially useful in heavy weather (e.g. snow, rain, mist, fog) where the effectiveness of halogen is greatly reduced. Its fluorescent detection properties also make it ideal for oil spill recovery operations, illuminating deck helipad circles, or for identifying navigation aids and other reflective floating objects.